These quick recipes will help you prepare your Thanksgiving meal. 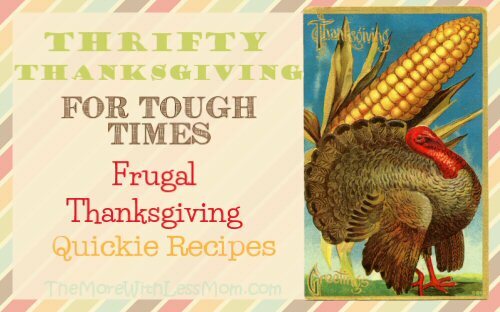 These are some quick and dirty recipes that might be useful for Thanksgiving, almost tips. These are like when grandma wrote out something on an index card, your best bet is to look up a “real” recipe if you’re not sure what you’re doing. You can make stock for free, I tell you, freee!! 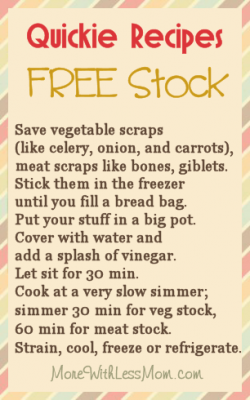 If you are a thrifty cook, you save vegetable scraps (mostly celery, onion, and carrot; ends, stems and peels) you can stick them in the freezer. When you fill a bread bag or have 5 c of scraps, make stock. If you are lucky you have bones from something (even a once-cooked something like rotisserie chicken), and maybe giblets and a neck from a turkey. If you are not you can skip that and make veggie stock. Put your stuff in a pot big enough to have two handles. Cover with water and add a splash of vinegar. Let sit for 30 min. Then cook at a very slow simmer, skimming foam, simmer about 30 min for veg stock, 60 min for meat stock. (Some people simmer the bones for up to 24 hours, then add the veggies 60 min from when you’re done.) Strain, cool, freeze or refrigerate. Square containers are really nice and can be found at the dollar store, or put a gallon zip bag in a margarine tub to fill, freeze on a cookie sheet, then store vertically. 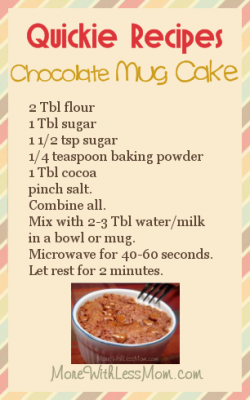 Fill a mug with water/dry milk/milk. Heat (microwave 2 min). 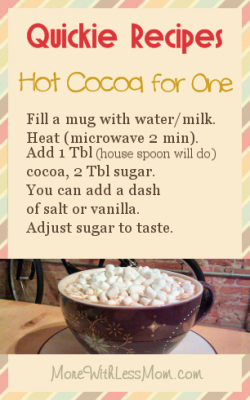 Add 1 Tbl (house spoon will do) cocoa, 2 Tbl sugar. You can add a dash of salt or vanilla. Adjust sugar to taste. 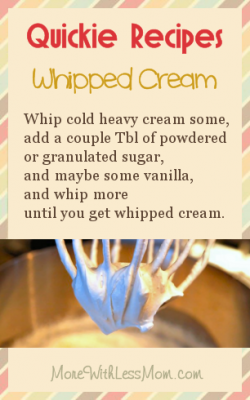 Whip cold heavy cream some, add a couple Tbl of powdered or granulated sugar, and maybe some vanilla, and whip more until you get whipped cream. Bonus: add 1 Tbl instant vanilla pudding to stabilize. There are lots of tips and tricks, but the best is to stuff the turkey cavity with celery. You can also use some onion, garlic, and carrot, but it must have celery. The turkey will absorb the moisture and some flavor from the veggies. Also your pan drippings will have more flavor. 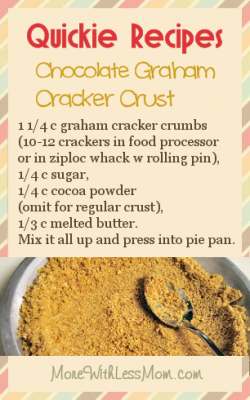 1 1/4 c graham cracker crumbs (10-12 crackers in the food processor, or in a ziploc with kids taking a whack at it with the rolling pin), 1/4 c sugar, 1/4 c cocoa powder (omit for regular crust), 1/3 c melted butter. 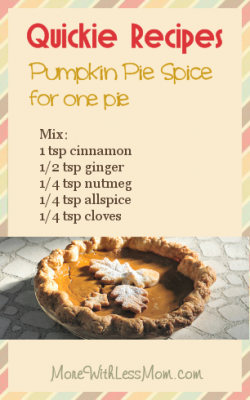 Mix it all up and press into a pie pan.